I Wrote a novel...now what??? We will be working in class through the editing process during Writer's Workshop. Once done, you can use FastPencil or CreateSpace to start the publishing process (if you met your word count goal). I just want to say congratulations to all STELM's young authors on a job well done! You are amazing!!! STELM students dove in head first to writing their first novel as they joined the ranks of amateur authors participating in National Novel Writing Month (NaNoWriMo). During the month of October they worked through elements of plot, character analysis and model novel comparison. Now they are feverishly writing their novels and working towards their self assigned word count goals. 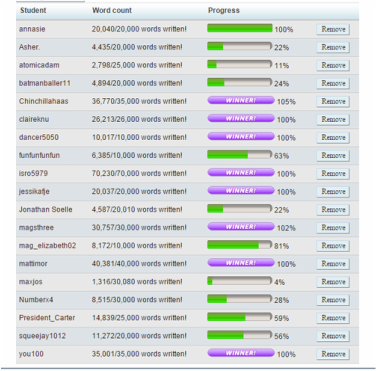 Visit the NaNoWriMo website to find out about this global program. 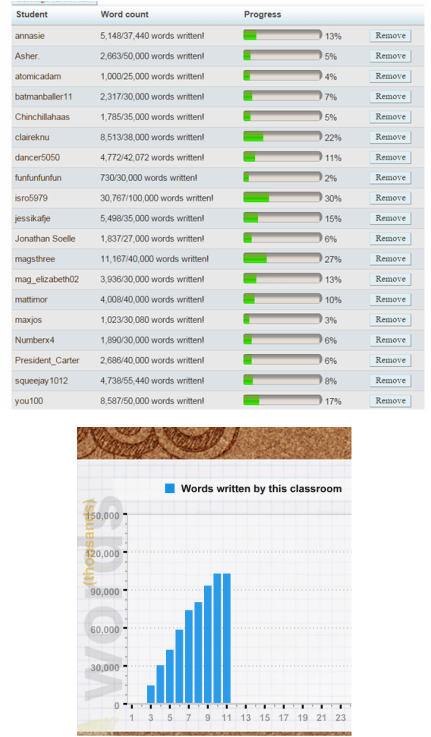 The image to the left shows the classes progress at the 5th day of writing. Keep up the good work!! Class goal: Have a published novel! *Choose an element of plot further in the novel and write that. Then go back and join the two sections together. *Revisit your character questionaire and elements of plot roller coaster. Most of all...do your best to reach your word count goal. I think every single one of you can do it! Here are the final tally marks. Great job to those of you who completed your novel!! Now it is time to revise and get ready to publish! If you are looking for support for writing dialogue, specifically using quotation marks, take this quick quiz and see what you are doing wrong! I can analyze a short story from the point of view of a reader and an author including plot, conflicts, character development, figurative language, and inferences. I can create a mind map discussing topics, characters, timeline and setting to include in my story and why I chose them. I can develop a protagonist, antagonist, and supporting characters with internal and external conflicts. I can structure a sequence of events for my short story including an exposition, inciting incident, rising action, climax, falling action, and resolution on a plot diagram. I can develop definite settings, with mood, for a personal short story. I can create a portion of written dialogue that is formatted correctly and uses creative tags. I can document my learning of story writing by creating an artifact and a well thought-out and thorough reflection on my portfolio website.